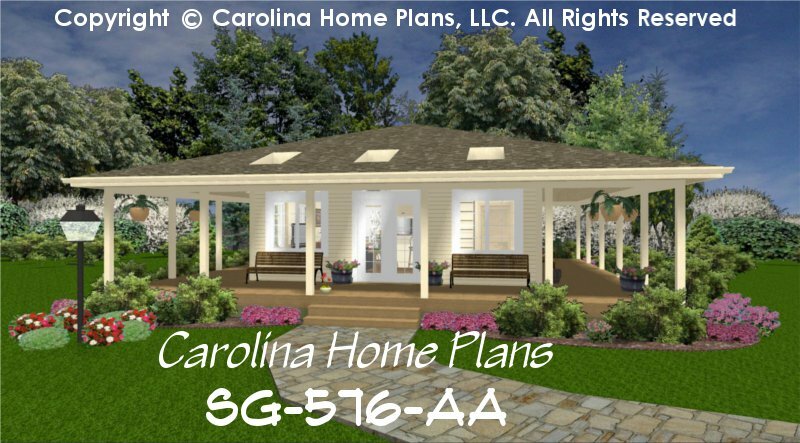 High cathedral ceilings, tall transom windows and a large wrap-around covered porch enhance this very small compact house plan making it seem larger than its actual size. The spacious, open floor plan layout provides ample room for entertaining or just lounging around. The kitchen features lots of cabinet storage for its compact size as well as a raised counter lunch bar for casual gatherings. French doors off the dining area lead to a covered back porch for outdoor enjoyment. 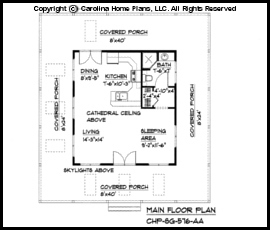 A comfortable size bath and closet/dressing area along with upper level storage accessible by a rolling, library style ladder complete this well organized small home floor plan. Plenty of porch skylights allow lots of natural light while still providing usable protected outdoor space. 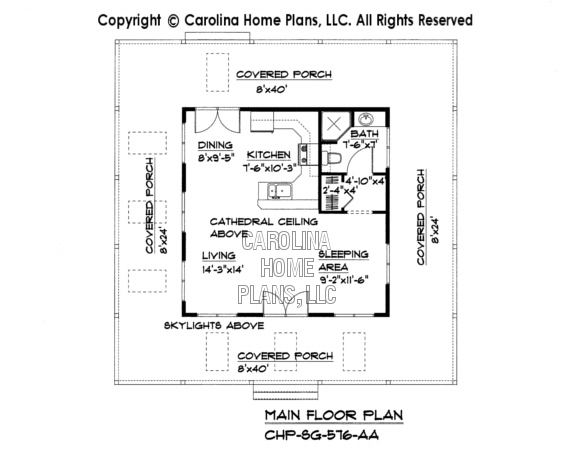 Whether for a single person or an empty nester couple, this comfortable, efficient tiny floor plan is ideal for downsizing or vacationing. Available options and pricing: See below. 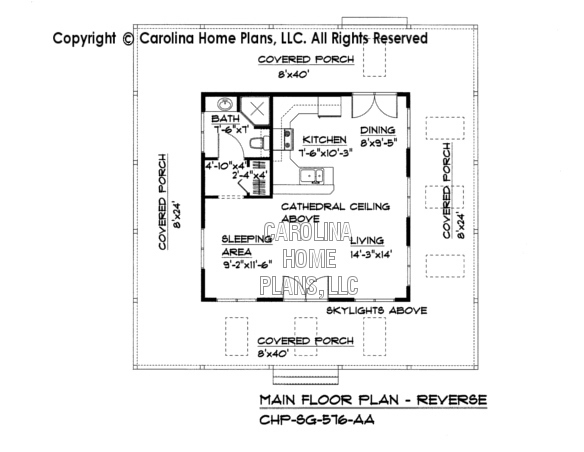 We originally designed this very small house plan for an artist who desperately needed a place of her own. She had recently gone through a nasty divorce and was not comfortable as a renter. Her limited budget dictated an economical structure, yet her discerning taste required attention to details and an aesthetically pleasing ambience. 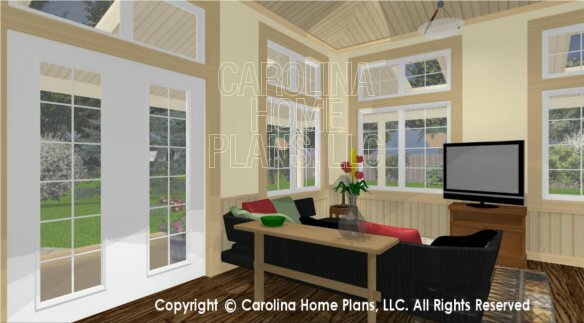 We created the open layout and full wrap-around porch to convey a spacious and airy cottage feel while maintaining a cozy and nurturing environment. Since light was very important for her work (as well as her spirits) we provided porch skylights and transoms wherever possible to compensate for the darkening affects that can result from a covered porch. Ceiling Height 10'; 14' Cathedral; 8' Bath/Clos.